Vegetable stew | Simply called "Food"
I didn’t know exactly if I was going to post this recipe because it was so simple and so “Empty fridge and freezer” that I didn’t feel it would interest anyone. But finally I decided to put it on thinking that it would help someone else on a “no inspiration for supper” night. 🙂 and that having a vegetarian meal doesn’t require much preparation. You could actually use any vegetable you have as long as you have coloured peppers. Sometimes you have some small pieces of vegetables left in your fridge but you don’t have enough to serve everybody or a bottom of a bag of vegetables hanging in your freezer but not enough to serve all your family. I just grab everything and assemble. 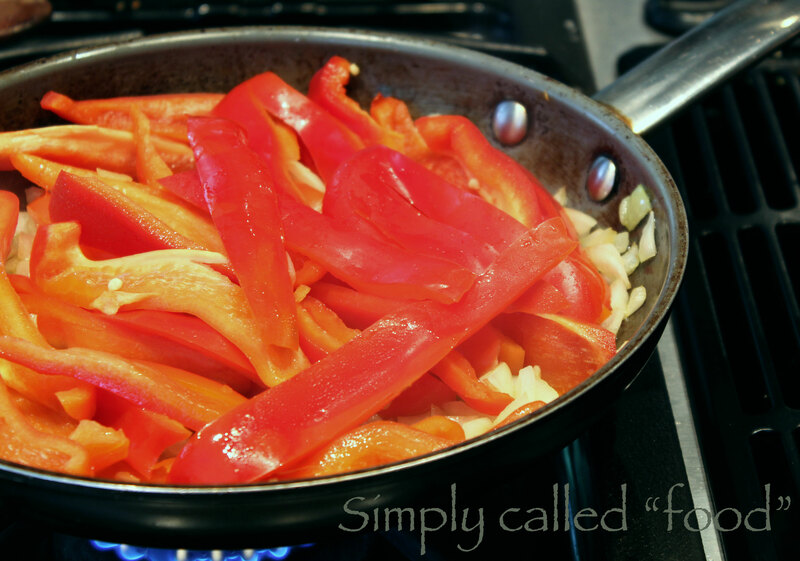 In a pan over medium heat, add the oil and cook the peppers and the onions for 15 minutes. In the meantime prepare and cook you quinoa. 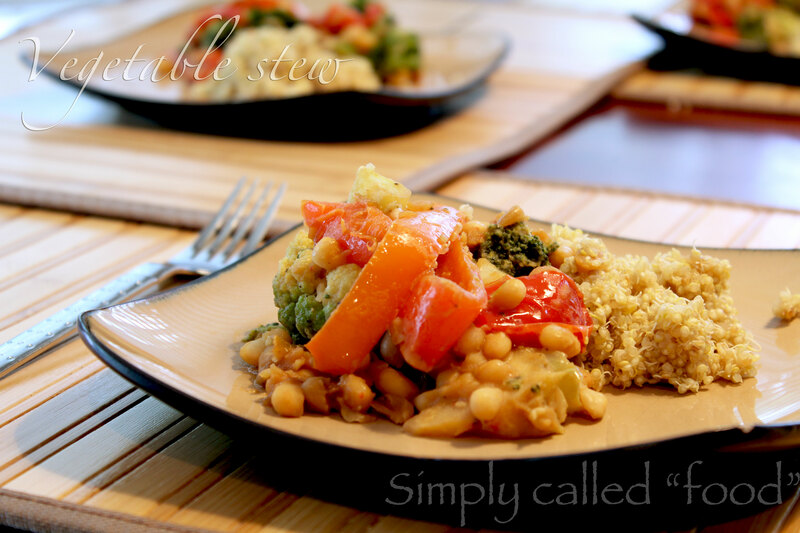 Then add the tomato, the broccoli, the cauliflower and the white beans, some salt and pepper and stir. Add 1/4 cup (62.5ml) of water, scape the bottom and cover for 10 minutes. Remove the cover and continue the cooking for 5 minutes. Add more water if you need to have more sauce but not too much so it doesn’t soak. Serve it with your quinoa. Tags: Food, Fruit and Vegetable, Gluten free, Legumes, Recipe, Vegan, Vegetarian. Bookmark the permalink. This is a great idea for using up last bit of veggies in the best way! I love veg dish full of colors, will surely make this asap…. thanks for stopping by at my place! This is a great idea of using up the last bit of veggies in the best way! 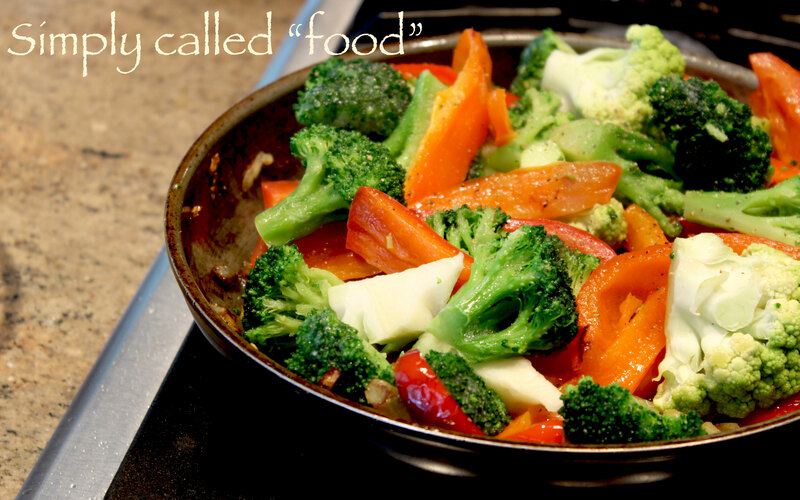 I love veg dishes with colors, will surely make this asap…. thanks for stopping by at my page! I’m happy you like the recipe! I always like to improvise with what I have in the fridge!